The Ideas Portal is a place where new ideas and suggestions can be logged and tracked. You are also able to search for other ideas and see the progress of these, including comments and information from the developers working on them. 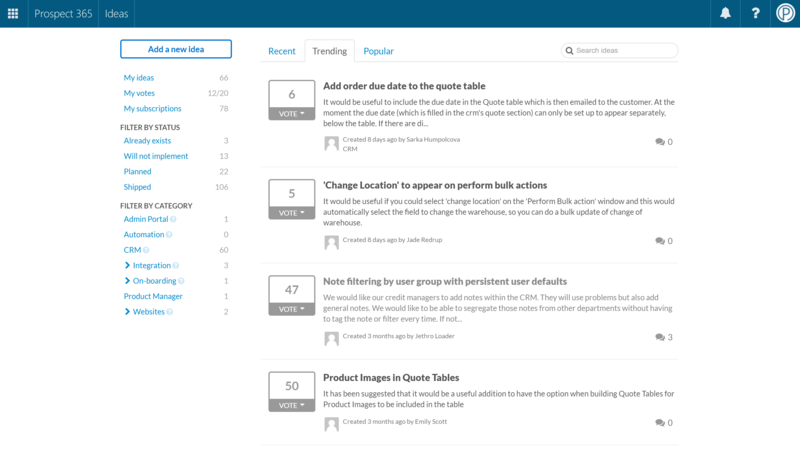 You can also access the Ideas Portal from within crm.prospect365.com by selecting the ‘?’ icon on the top right hand side and then picking ‘Product Suggestions’, as shown below. This will then take you into the Ideas Portal. The Ideas Portal is split into different sections to make it easier to navigate for you. At the top there are three tabs which will sort all the ideas into ‘Recent’, ‘Trending’ or ‘Popular’. There is also a keyword search on the right hand side where you can enter a specific string of text to help you search for an idea. On the left of the Ideas Portal there is further filtering which you can use to narrow down your search selection. The top section is to do with ideas you have submitted,voted for or subscribed to. You can then also filter by the Status which has been set against your idea or the category which is was originally logged under. You will receive emails for any ideas you have voted for, if you prefer not to receive these updates then in the idea section there is an ‘Unsubscribe’ button. This is a great way to check on all of the ‘Planned’ or‘Shipped’ ideas to see what new features have been introduced, or are about to be introduced. 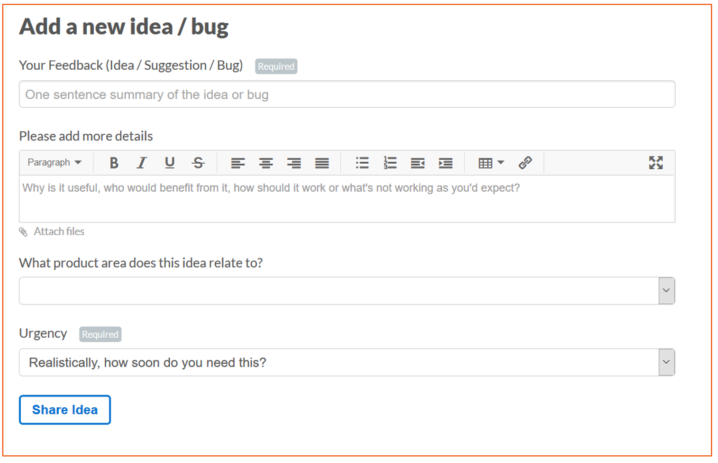 At the top of the Ideas Portal is the button for ‘Add anew idea / bug’, as shown below. This will allow you to log a new idea into the portal. The more information you can enter here including whatever files you choose to attach will make it easier for our developers to assess and review your idea. Once you have shared your idea you will then be emailed about any alterations which take place or if comments get added to it. This makes it very easy to keep a track on ideas you have logged and what status they are currently in. Once you have logged your idea or found another idea which you are interested in you can vote for this idea and also add additional comments about it. You will notice a ‘Vote’ box with the total number of votes associated with it on the left of all ideas. Once you have voted for an idea it will then be highlighted in green to help differentiate it from other ideas. Once you click on an idea it will give you more information about it but also the ability to add comments to it. These comments could be supporting evidence on a subject or an additional feature which may be useful as part of the idea in question.